"Clothes make the man, and a mustache couldn't hurt either," will apparently be the trial theme in Richard Rodriguez's case against the city of El Monte, California. Rodriguez sued the city in July, alleging that a police officer used excessive force against him at the end of a lengthy chase. The official position is that the officer used a "distraction blow," though Rodriguez alleges that the officer kicked him in the head. (Based on the YouTube video of the incident, he may have a point.) I imagine that is probably an effective way to distract someone, but Rodriguez insists it was unnecessary. Rodriguez now claims to suffer from headaches and blurred vision, among other things, and is suing the city for $5 million. One possible problem: Rodriguez is a heavily tattooed gang member who, as one of his many decorations, has the name of his gang tattooed on his upper lip. Not the sort of thing that goes down well with your average juror, probably, even in Los Angeles. In addition to a conservative suit and tie, and some hair to cover the scalp tattoos, Rodriguez will be growing what the L.A. Times described as a "Magnum P.I." mustache to cover his gang-inscribed lip. "People get past looks when you put on a suit and your hair is grown," said Pacheco, although that is probably not true. Again, not a bad idea, but I think he may have fired this opening shot too soon. 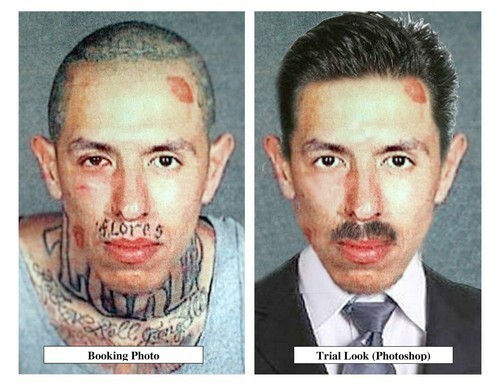 If he can Photoshop his client, so can the DA.